New season Koi are now available at Squire’s Garden Centres in Badshot Lea, Twickenham, Stanmore and Washington. Squire’s in Badshot Lea stocks the largest selection of Koi, numbering thousands, and also offers the largest specimen fish. Sanke – colour, white with red and black markings. Ochiba – colour, grey and with brown markings along the back. All Koi at Squire’s are hand selected from Israel, with only the best quality fish being chosen, and great care is taken regarding their health and welfare. The fish have been through three weeks’ quarantine, are rested, acclimatized, and ready for sale now. Varieties – There are over 22 varieties of Koi, each categorised by their colour, pattern and nature of their scales. ‘Ochiba’ in Japanese relates to autumn leaves floating in water. Value – The value of each fish is determined in part by how closely its colour and patterns adhere to the ideal for its particular variety. Symbolism – Koi represent love and friendship in Japanese culture, and they prefer to have the company of other Koi in their pond! Sunburn – Koi can actually get sunburnt, so make sure they have shade over their pond. 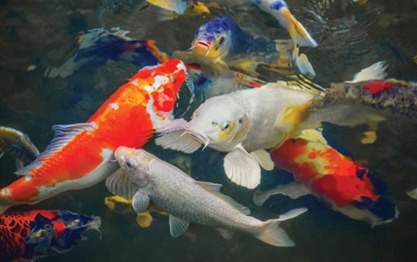 Diet – Koi are omnivores, eating both plants and animals. They eat insects, snails and worms, as well as enjoying plants, fruit, and even lettuce and peas! Water Temperature – Koi are cold-water fish but benefit from being kept in water between 15-25 degrees centigrade and must be regularly maintained. The water depth ideally needs to be a minimum of 1.5m to enable the fish to regulate their temperature. Winter – Koi, and many other fish, go into a kind of dormancy in the winter, using less oxygen and naturally settling to the bottom of the pond where the water is warmer. Lifespan – Koi usually live between 30 and 60 years but, amazingly, have been known to survive for more than 200 years!